Archives : DRAGON-FLY DOJI IN SENSEX - 27/05/2011. DRAGON-FLY DOJI IN SENSEX – 27/05/2011. Last weeks market movement was exactly as per script. Market was in a downtrend in all the time-frames and as a result the testing of the critical support was on the cards. As mentioned in the last weeks article, the critical support was at Sensex 17784 and Nifty 5319 and the market went exactly near that level before staging a bounce-back. It was of paramount importance that the support level which was in the form of trendline be respected; as it has been supporting the market for the past 18 months. IS IT A TREND REVERSAL. There is a Bullish Hammer formation in the Nifty and a Dragon-Fly Doji in the Sensex. These patterns are suggestive of a price reversal in the very short term time-frame. But the question is will it reverse the trend. For the intermediate trend to reverse the market has to close above Sensex 19038 and Nifty 5709 and the long term trend reversal will happen only if the market continues to stay above Sensex 19651 and Nifty 5895. Till then the minor price reversals will be termed as pull-backs and not trend reversals. The Sensex opened the week at 18269 made a high of 18298, a low of 17786 and closed the week at 18266. The Sensex lost 60 points on a weekly basis. Similarly Nifty opened the week at 5456, made a high of 5485, a low of 5328 and closed the week at 5476. The Nifty closed with a minor loss of 10 points on a weekly basis. Both the indices have formed Bullish Reversal Patterns as seen on the weekly charts. Sensex has formed a Dragon-Fly Doji formation whereas the Nifty has formed a Bullish White body Hammer. Both the formations can be termed as Takuri Line formations because of the long lower shadow. A Takuri Line at the end of a downtrend signals a strong bullish upward price movement in the very short term time-frame. On the daily charts, Sensex has formed a big white body candle whereas the Nifty has formed an Opening White Body Marubuzo. The daily formations are also suggestive of a continuation of the bullish upmove in the very short term. Sensex has left behind a Rising Gap while moving upwards, between 18072-18087. This gap will provide support in case of a fall. Since there is a bullish reversal candlestick pattern formed on the weekly charts, one can expect some sort of pull-back action on both the indices as long as low of 17786 for the Sensex and 5328 for the Nifty is not violated. We have to consider a pull-back of the fall from 19811-17786 for the Sensex and 5944-5328 for the Nifty. The pull-back levels are placed at 18560-18799-19038 for the Sensex and 5563-5636-5709 for the Nifty. If we consider the entire fall from 21108 to 17295 for the Sensex and 6318 to 5177 for the Nifty then the pull-back levels are 18751-19202-19651 for the Sensex and 5621-5758-5895 for the Nifty. The market is well below the long term average i.e. 200dma (Sensex – 19172 and Nifty – 5754), medium term average of 50dma (Sensex – 18777 and Nifty – 5634) and short term average of 20dma (Sensex – 18321 and Nifty – 5489). As a result, all the three trends the short term, the medium term and the long term trends are down. Both the indices are just lurking below the 20dma and a short term trend reversal will be in place if the prices manage a close above the 20dma. In fact the short term, medium term and the long term averages are above the current market price and as a result, they will act as resistances going forward. There exists a strong support line in the form of demand trendline at Sensex 17821 and Nifty 5331. This is a very critical support line and the market has been respecting it for the past 18months. The market tested this trendline last week and managed a smart bounce-back from this trendline. A breach of this support line will confirm a Bearish Head and Shoulders Reversal pattern. This will be herald a strong bear onslaught. On the higher side the 50% pull-back level of the immediate fall, 38.2% of the entire fall, and 50dma all converge and are placed nearby, thus forming first resistance zone i.e. from Sensex 18751-18799 and Nifty 5621-5636. Above this, there is a second resistance zone formed by the convergence of 50% of the entire fall and 200dma. Thus Sensex 19172-19202 and Nifty 5754-5758 forms a second resistance zone. The market completed a small Bearish Head & Shoulders last week and the target for which is Sensex 16573 and Nifty 4964. The target for this Bearish Head and Shoulders will remain intact as long as the market remains below Sensex 18724 and Nifty 5605. All the major oscillators continue in their Sell mode. MACD and ROC both are in negative territory and continue with their Sell signals but both have started turning upwards. RSI at 45, too continues with its Sell mode. Bollinger band which had given a Sell signal two weeks ago continues with its Sell signal. A close above the 20dma (Sensex – 18321 and Nifty – 5489) will negate the Sell signal generated by the Bollinger Band. Money Flow (52) has moved higher and has signaled a Buy. MFI suggests that money has flowed in the market at lower levels. OBV has started moving higher but is yet to signal a Buy. Stochastic oscillator has just given a Buy signal as %K has cut %D from below. The Directional Indicators too continue with their Sell signal as +DI remains below –DI, but they are converging suggesting that the downtrend has lost some strength. Nifty O.I. PCR is reasonably placed at 1.31. The Options build up presents an interesting picture. Highest Open Interest build-up is seen at 5000 Put followed by 5300 Put. Highest Call writing is seen at the strikes of 5800 followed by 5600. This suggests that in the short term the market is likely to move in a range of 5300 to 5600. A bearish breach of the above mentioned range will lead to 5000 on the lower side and a bullish breach of the range will lead to 5800 on the higher side. 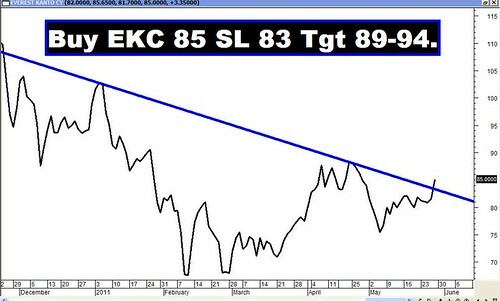 The Trendline Resistance for the Sensex is at 19349. The Trendline Support is at 17821. The Trendline Resistance for the Nifty is at 5812. The Trendline Support is at 5331. For the week ahead, Sensex will find Support at 18020-17786-17546 and will find Resistance at 18542-18794-19074. For the week ahead, Nifty will find Support at 5401-5328-5242 and will find Resistance at 5556-5634-5721. Almost all the recommendations achieved their targets, except for Educomp. The Star performer for the week was Jain Irrigation which went down by around 6%.